Why do we love the change we choose (think makeovers and remodeling), but not the change that’s chosen for us? Why do we limit ourselves to embracing only the changes we are wise enough to give ourselves? Change can be scary. It can even be painful. Change takes us out of our comfort zone and moves us somewhere we haven’t been before. So how do we embrace it? How do we experience it without so much pain and maybe even with a little pleasure? 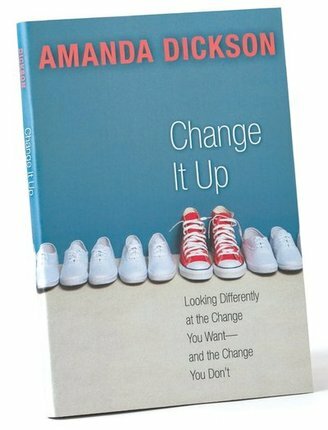 Author and popular radio personality Amanda Dickson offers simple suggestions for integrating change in our lives. Included are tips for making easy changes that will help us get comfortable with the concept of change, suggestions for looking at our lives in new ways, and liberating perspectives on the changes we get to choose. For anyone struggling with change — or fearful of change — this book provides practical ideas to make that change easier. Amanda Dickson’s boundless energy, infectious laugh, and passion for life have made her a well-known personality as a radio morning show co-host in Salt Lake City, Utah. She graduated from the University of Utah with a B.A. in English and a Juris Doctorate. After practicing law for a few years, she realized it simply wasn't in her nature to be a fighter. She felt very fortunate to return to KSL Radio and her passion for serving the community. Over the years, Amanda has been, among many things, a waitress, lawyer, college instructor, disc jockey, restaurant manager, receptionist, pizza maker, and author. She is the author of Wake Up to a Happier Life and her latest, Change It Up. Amanda is the mother of two and stepmother of three and resides in Salt Lake City with her husband, Aaron. This is a well written book.Each chapter builds up and supports the main premise . The chapter that deals with habits and the truth about them is simple and profound. It was a "That it " moment for me ! This book is well worth the price and should probably be read by everyone. Thank you ,Amanda for taking the time to share your heart and life in this book. I love this book. Amanda's smart and witty wisdom make this book fun and life changing. She has helped me learn that in order to see and enjoy change, I have to see it from a different angle. Even though some of life's differences are still challenging, I have learned to love and smile through it!